On that evening, we head out into the narrow, winding streets of the historical centre of Genoa. We're not sure exactly where to go, but we have an idea: toward the fountain, right onto a back street, past the cathedral, down an alleyway. It's dark outside but the twinkling streetlamps guide us, and it's so warm that we could roam the streets for hours, if we had nowhere else to be. We approach the palazzo (the Italian word for apartment building). Some palazzi are historically significant palaces, still adorned with regal marble staircases and fresco-filled walls. This one, like ours, lacks extravagant décor, but has a style that is quintessentially European. We enter through the oversized portone (front door) and walk up the stairs slowly, reminiscing about the many times we've found ourselves lost in the vicoli (narrow streets) of Genoa and even in the palazzi themselves, trying to find a specific apartment. This time, however, we find the apartment relatively quickly. To get through the doorway, my husband (standing at almost 200 cm) has to crouch down, and we realise that we can see our friend's entire home from this vantage point, just by looking left and right. The living area on the left (which includes a kitchen, couch, and dining table with chairs) and a bedroom on the right (which my husband is too tall for, once again). By Western standards, the apartment is probably the size of a middle-class teenager's bedroom. 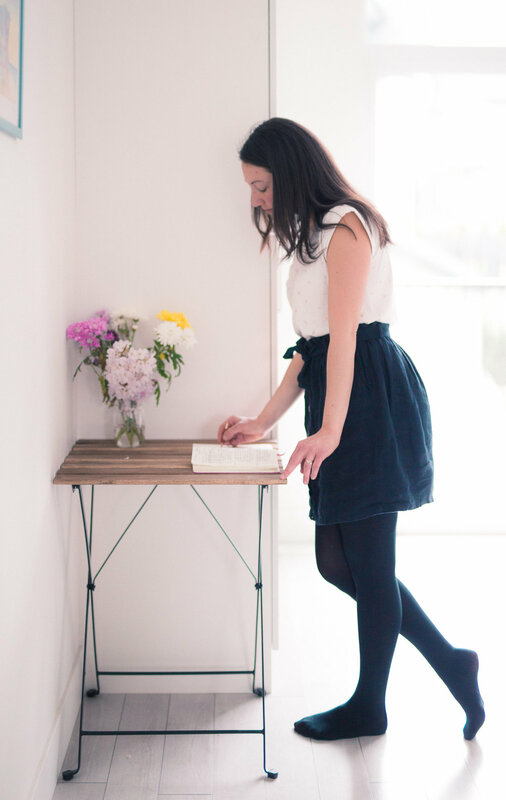 After living in Italy for over a year, we're used to the small spaces which are simultaneously cozy, functional, and sustainable. I watch carefully, yet unintrusively, as he sautées, stirs, adds elements, and stirs again. This continues for some time, intermingled with chatter, lots of laughter, an appetizer, and of course, a glass of wine. The time flies by, and before we know it, we are sitting down to a creamy, luscious risotto. Made by hand, authentically and with love, as the best meals always are. The risotto we had that night was not strawberry-based -- this is my own spring/summer version of risotto. Risotto will always remind me of that extraordinary night. So, this is an ode to a friend who made me risotto. Use a wide pan to make risotto, preferably with straight sides. Keep the stock in a small pot, simmering on the stove. Sautée the chopped onion in 1 tbsp of butter, over a low-medium heat, until translucent but not browned (about 2 to 3 minutes). Add the rice (unrinsed) and stir, heating each grain of rice but again, not browning it. Continue stirring until it is heated through (another 2 minutes). Add the wine and stir until it evaporates. Add the stock one ladleful at a time. Stir continuously (making sure that the rice doesn't stick to the bottom of the pan) until most of the stock is evaporated. Then, add another ladle of stock and repeat the process. After 15 minutes, check the rice for doneness. It should be al dente, which means it is cooked but has a "bite" or "chew" to it. If it's not ready, keep repeating the above process (stock, stir, repeat) until it is, checking it after each addition of stock. When the rice is al dente, add the chopped strawberries and stir for 2 minutes. Remove the pan from the heat and stir in 1 tbsp of butter and 3 tbsp of parmesan. Cover and let rest for 3 minutes. 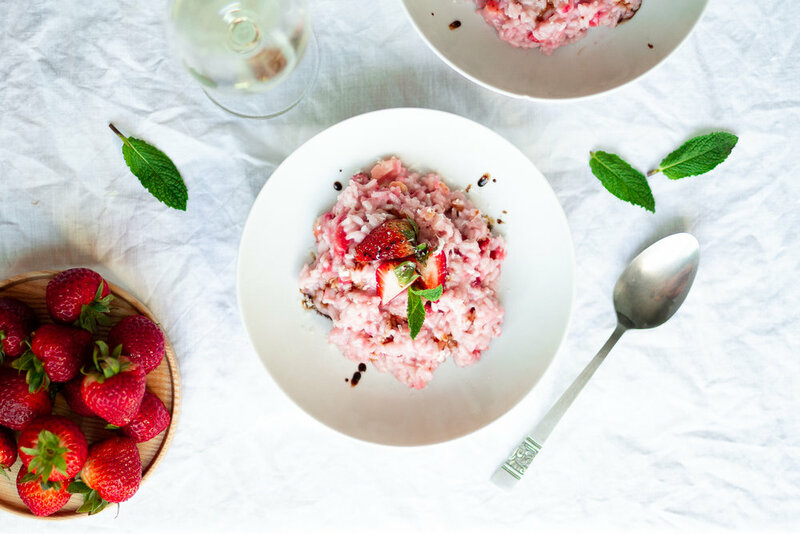 To serve, spoon a good amount of risotto into a pasta plate and top with a few strawberry slices, a sprinkle of parmesan, and a drizzle of balsamic or saba. *A note about rice: The best risotto will be made with a starchy short- or medium-grain rice. The most common varieties that can be found in the supermarket are arborio and carnaroli. **A note about stock: If you don't have stock on hand, that's okay. Just pour the desired amount of water in a pot, add some salt and aromatics (onion, celery, herbs), and bring to a boil. Let it simmer while you get started on the other steps.